Pearson test of English Academic is an International English Language Test which is basically an online test having four different Modules i.e., Speaking, Writing, Reading and Listening. This test is valid for the next 2 years after date of the exam given. Every person who is given is marked on a scale from 10-90. PTE test is now valid in numerous colleges of United States and United Kingdom, also, in all of the Australia and New Zealand universities. The PTE coaching in Gurgaon offers 2 types of coaching based on the types of PTE examination i.e., General and Academic to judge the proficiency of English by the aspirants. Pteexams.com has certified and trained faculty for training students for the PTE exam. Enroll now to our PTE coaching centre in Gurgaon and be a part of our family. The most amazing benefit of PTE exam is that the result comes within 5 working days, so that student doesn’t have to wait too much for further decisions. The nominal age is 16 years and you can take the PTE exam as many times you wish to do so. Our PTE institute in Gurgaon offers experienced certified trainers with years of industry experience including the training part. Our course has free sample papers and study material with the option of Regular feedback and personalized attention. When you join one of the better PTE coaching centers, you can get classes to learn more through interactions and group discussions. Our aim is to help the students in achieving success in the PTE test and our trainers can help you in giving top quality PTE coaching by designing the curriculum in such a way that feeds your student well. With various PTE coaching strategies like Efficient Time management, Mock tests, Problem solving and strategy making sessions that give our students the obvious training they need. The PTE academic tests the Listening, Reading, Writing and Speaking session and we provide the most effective pre coaching without making a hole in your pocket. IELTS abbreviated as International English Language Testing System is considered as the world’s most popular English language test. Interestingly, there are more than 3 million aspirants who have taken the test on every year. You can securely apply to this English language test if thinking about staying in UK, New Zealand, Australia and Canada.Set your life to abroad country by enroling yourself into IELTS caoching centre in Gurgaon. We procide fruitful coaching for IELTS academic and IELTS general training. 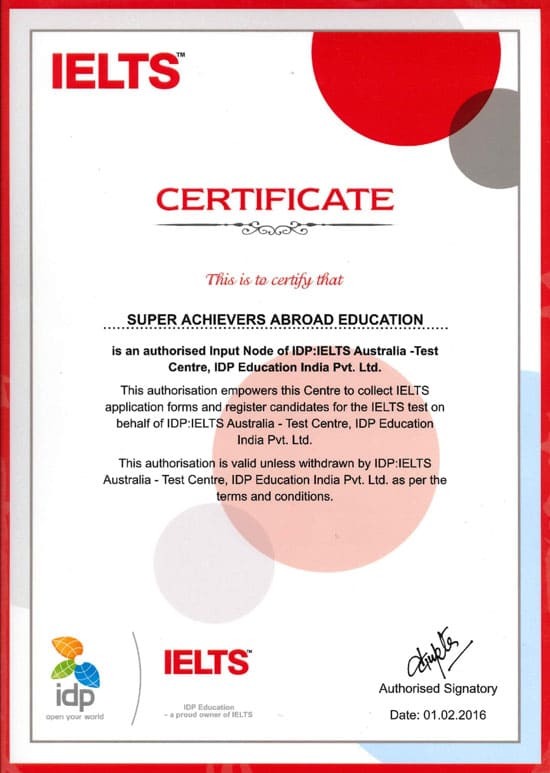 Super Achievers is a coaching centre in Gurgaon that can help you to deal with the aspects of IELTS and PTE examinations. Clarify your preferred exam with the basic as well as advanced coaching by our support specialist faculties. Regular assessment tests are taken to prepare the aspirants with extra doubt clearing sessions. Student will be provided with a safe environment that is customised with excellent IELTS and PTE study material. The PTE exam is accepted by Australian government for Visa applications. PTE exams has a solid trackback of result. Enroll now!!! I would like to thank you for all the support and encouragement throughout the training. Surprised to see highest score in the section where i really struggled before. I just got my PTE academic score card. And it's positive. I got my required score 65+ in each section. I was struggling to get the score. I really wanted to Thank you to support me. Motivation, kind words and support i got from you is totally unmatched. I will come to center to meet you and thanks you personally. And saying over email is not sufficient. Thank you again for all supports and being there for me. With you guidance, I was able to score 90 points in listening, Reading and Speaking each and 80 points in Writing. You Know how nervous i was with my speaking and how you spend an hour with me on Skype, a day before the exam, to correct my mistakes. Had it not been your diligence and guidance, i would not have got this score. Your faith in my abilities and your in-depth knowledge of the critical factors of PTE made me achieve this feat. Once again, i really thank both of you for your guidance. I would like this opportunity to thank Shobhit Sir and Dolly Ma'am who helped me in getting the desired score. It would not have been possible for me to score without your guidance and support. All the strategies, tips and tricks which Sir provided proved to be useful in cracking PTE-A exam. Shobhit Sir is a real Guru of PTE-Academic. Both sir as well as Ma'am, boost the confidence and provide proper attention to each student. Joining SAAE for PTE-A and IELTS is the best decision to clear the exams in a short duration. Thanks Robert Sir for sharing the relevant study material and important information.